After my dad died, my family and I decided that going into his office for the first time should be a group excursion. Since Billy shared office space with my dad, this needed to happen before he went back to work. So on a Sunday evening, I stayed back and made dinner for everyone while my mother and brothers went to dad’s office. The girls and I had given it to him a few years ago. I had since noticed it resting on a shelf behind his desk. I loved seeing it there. 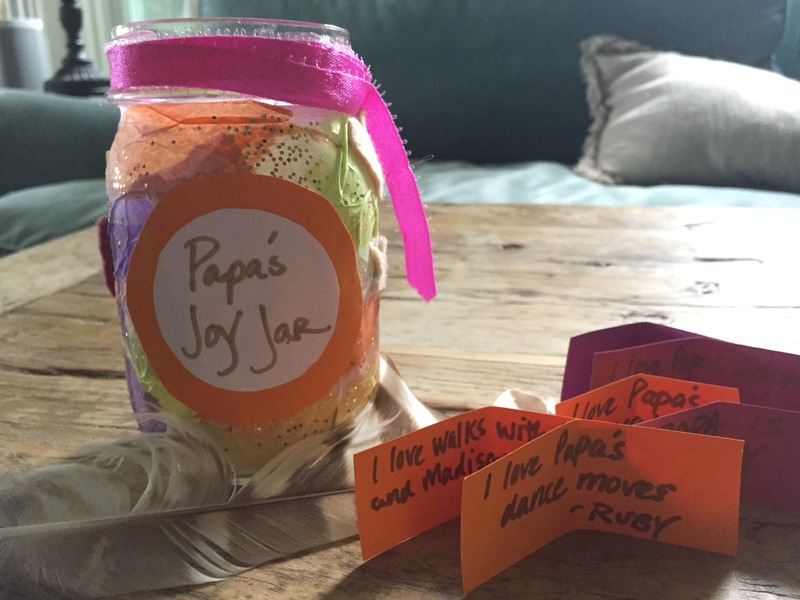 What is a Joy Jar? It’s a Jar full of bits of paper – each written with the intention of eliciting happiness. On each piece of paper we had written either something we loved about him, or something we knew brought him happiness. The idea was, anytime he was feeling low, he could reach into his Joy Jar and pull out a piece of paper to read something that would make him smile. So, I am now the default owner of Papa’s Joy Jar. My intention at some point in the near future, at a family gathering, is to have everyone write something they loved about Papa, and place it in the Jar. That way, when we are feeling sad, we can reach into the Jar and pull out something that will make us smile. I think we’re gonna need a bigger Jar.